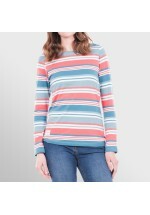 From Brakeburn, this ladies bright multi-stripes full length sleeved tee is made from soft-feel prem..
100% cotton top with a nautical inspired navy and white stripe. With a flattering neckline featuring..
Our classic and ""oh so wearable"" Patch Pocket Jumper is a lightweight summer knit in navy with bri.. This green pleated tee from Brakeburn is made from soft cotton-feel cotton that's been treated with ..
Easy-fit shift-style polka cotton dress in a heavy winter-weight cotton. Comes with zipped-back clos.. This navy tee from Brakeburn features a cute repeat polka flower pattern. Add to that a flattering n.. This ladies pull-over hood comes with a floral lined hood, wide woven pull cords, soft ribbing at he..
From Brakeburn, ladies Robin Blossom backpack. 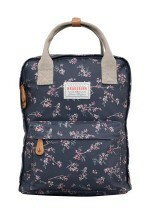 Featuring zipped main compartment, zipped external po..
From Brakeburn, neat little wallet with blossom and robin print. Internal features include zipped co..
Slim-fit, cropped chino in blue made from a cotton-rich blend with elastane for added stretch and a ..
Our Shells Dress in coral is an easy to wear T-shirt style in a bright and bold shell print for a ..
Made from a lightweight pattern-woven cotton, this Short Sleeve Blouse is a classic wardrobe essenti.. Slim fit denim washed in look jeans in dark navy comes with front and tapered rear pockets, zip and ..